Fort Point filmmakers, Tracy Heather Strain and Randal MacLowry of The Film Posse, are the producers behind the first feature documentary about Lorraine Hansberry premiering tonight on American Masters at 9 pm on PBS. 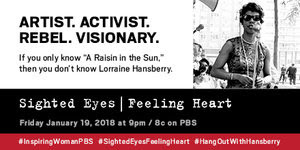 Sighted Eyes / Feeling Heart delves into the life of the playwright famously known for A Raisin In The Sun and reveals her impact as an artist, activist, revolutionary, rebel and visionary. The film reveals Hansberry’s prescient works tackling race, human rights, women’s equality and sexuality that anticipated social and political movements on the horizon. The Toronto International Film Festival, DOC NYC Film Festival, and Chicago International Film Festival chose Sighted Eyes / Feeling Heart as an official selection. Tune into American Masters Friday, January 19, 2018 at 9 pm to discover the inspiring life of Lorraine Hansberry. In the words of Ms Strain "If you only know A Raisin In The Sun, then you don't know Lorraine Hansberry."